It is not often something innocuous as a discarded can triggers such thoughts, but this is one of them. It cannot be seen in the picture but the full motto on the can is gives you power like HELL — a motto that along with the logo that today still makes my blood run cold. 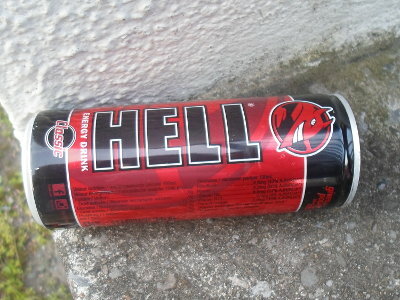 In my early post-doc days, in other words around now eight years ago, this particular energy drink was a staple of mine, and there was virtually always one staring at me next to my workstation. Although my caffeine consumption at the time was not quite at the Redbull for Breakfast stage that was part of my near burnout back in 2011-2012, this particular brand is the one that persists in my memories. For context at the time I considered myself lucky to have secured a job, as late-2009 to early-2010 was the complete depths of the post-Credit Crunch crash in the job market — not that long afterwards from when my university's careers web-site was empty. While I was happy in the sense that my work was not being ignored in the way I felt at times during my Ph.D, insecurity was never far away. I had pretty much maxed out my credit card, and paying off debts such as that was a very high priority — it was one of two times in my life I put a serious squeeze on my finances, and of the two it is the one that had more of a long-term effect on my. In terms of what I felt of my professional work, those days probably had my highest-ever job satisfaction, but the era as a whole is one that I do not look back on. I was building the foundations of my career at a time when work-life balance meant “you work or you life hangs in the balance”, and in hindsight I am not exactly sure about the ‘or’ bit.